The book reports on the current state on HCI in biomedicine and health care, focusing on the role of human factors, patient safety well as methodological underpinnings of HCI theories and its application for biomedical informatics. Theories, models and frameworks for human-computer interaction (HCI) have been recognized as key contributors for the design, development and use of computer-based systems. In the clinical domain, key themes that litter the research landscape of health information technology (HIT) are usability, decision support and clinical workflow - all of which are affected directly or indirectly by the nature of HCI. While the implications of HCI principles for the design of HIT are acknowledged, the adoption of the tools and techniques among clinicians, informatics researchers and developers of HIT are limited. There is a general consensus that HIT has not realized its potential as a tool to facilitate clinical decision-making, the coordination of care and improves patient safety. Embracing sound principles of iterative design can yield significant dividends. It can also enhance practitioner's abilities to meet "meaningful use" requirements. The purpose of the book is two-fold: to address key gaps on the applicability of theories, models and evaluation frameworks of HCI and human factors for research in biomedical informatics. It highlights the state of the art, drawing from the current research in HCI. 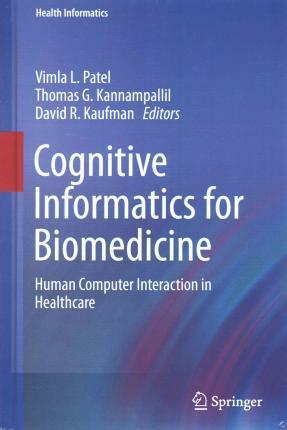 Second, it also serves as a graduate level textbook highlighting key topics in HCI relevant for biomedical informatics, computer science and social science students working in the healthcare domain. For instructional purposes, the book provides additional information and a set of questions for interactive class discussion for each section. The purpose of these questions is to encourage students to apply the learned concepts to real world healthcare problems. Illustrations note 39 Illustrations, color; 19 Illustrations, black and white; XIX, 332 p. 58 illus., 39 illus. in color. This book reports on the current state of human computer interaction (HCI) in biomedicine and healthcare, focusing on the cognitive underpinnings of human interactions with people and technology. Drawing from the current research in HCI, this book addresses key theories, models and evaluation frameworks, and their application in biomedical contexts. Health information technologies have become increasingly vital tools for the practice of clinical medicine. However, numerous challenges remain in order to fully realize their potential as instruments for advancing clinical care and enhancing patient safety. Cognitive Informatics for Biomedicine: Human Computer Interaction in Healthcare is indispensable to those who want to ensure that the systems they build, and the interactive environments that they promote, will reflect the rigor and dedication to human-computer interaction principles that will ultimately enhance both the user's experience and the quality and safety of the care that is offered to patients. Book Overview: Role of HCI in biomedicine and healthcare.- HCI, Human Factors, Patient Safety and Quality.- Theories and Foundations of HCI: Cognition.- Theories and Foundations of HCI: Communication.- Theories and Foundations of HCI: Distributed Clinical Work.- Methods of Evaluation.- New approaches to representing and analyzing human computer interactions.- User Interfaces.- Medical devices.- Application of Usability Evaluation in Healthcare Settings.- Visualization in Biomedical Informatics: Tools and Applications in the Clinical Environment.- Face-to-face synchronous and asynchronous interactions in clinical settings.- Team Activities and Processes.- Mobile Health Applications and Biomedicine.- Consumer Health.- Challenges for HCI and HF for the Next Decade in Healthcare. Vimla L Patel, PhD, DSc, FRSC, is a Senior Research Scientist and the Director of the Center for Cognitive Studies in Medicine and Public Health at the New York Academy of Medicine. She is an adjunct professor of Biomedical Informatics at Columbia University and of Public Health at Weill Cornell College of Medicine. Her studies focus on complexity of the distributed cognitive system, generation of medical errors, the impact of technology on human cognition, and resulting insights on how to design a safer clinical workplace. She currently teaches a course on human factors and human computer Interaction with Dr Kaufman to graduate students in biomedical informatics and computer science. Thomas G. Kannampallil is a researcher and assistant director at the Center for Cognitive Studies in Medicine and Public Health at the New York Academy of Medicine. With a varied background in computational cognitive science, psychology, statistics and computer science, his research focuses on applying computational, algorithmic and network-based techniques in analyzing the microstructure of human behavior in dynamic, complex environments. These techniques are used to understand and characterize human interactive human behavior, work practices and strategies, and build cognitive support systems that can improve help in making more effective decisions, reducing errors and improving human performance in complex environments. David R. Kaufman, PhD is an Associate Professor at Arizona State University. Dr. Kaufman's primary research interests include 1) human computer interaction in the context of health information technologies, 2) information seeking behavior and decision making in healthcare contexts, especially as it relates to the elderly, digital divide and low literacy populations, and 3) conceptual understanding of biomedical information and decision making by lay people.